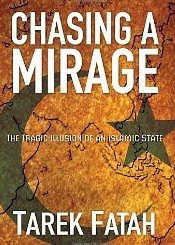 It’s taken me quite a while to finish reading Tarek Fatah’s book Chasing a Mirage, The Tragic Illusion of an Islamic State. It’s a controversial book. I’d even say that it’s an incendiary book; but equally it’s refreshing, bold, frank and incisive. Post 9/11, as the world has tried to understand the phenomenon of radical Islam, and the fanaticism and intolerance of its votaries. M. J. Akbar’s Shades of Sword: Jihad and the conflict between Islam & Christianity and Tariq Ali’s Clash of Fundamentalism (both published in 2002) deal with these issues and give an expansive and inclusive interpretation of Islam. Tarek Fatah’s book belongs to the same genre and gives a valuable insight into a religion that is usually misrepresented. Fatah’s book, while giving a plethora of arguments that prove that the pursuit of an Islamic state is chimerical, also underlines the innate appeal of the religion to its adherents. My knowledge of Islamic history and theology is non-existent and it would be improper for me to comment on the efficacy of the arguments that Fatah makes in his book. I found them convincing; there are many who will find his arguments provocative. We can’t be dismissive of such scholarship. A debate I’d like to see in Toronto is between Sheema Khan (Of Hockey and Hijab: Reflections of a Canadian Muslim Woman) and Tarek Fatah. While I’ve no doubt that such a debate would be polite and civil, it would still bristle with cutting edge erudition and sharp arguments. It is necessary to have such debates. The next blog entry (see below) is an excerpt from the book. I must hasten to add that like most secular Hindus, I felt personally wounded when the Babri Masjid was brought down by Hindu fanatics in 1992.